Miami is known worldwide for the beauty of it’s beaches and for it’s enormous shopping centers, but not so much for it’s urban richness. However, Miami is a city with a unique architectural character. 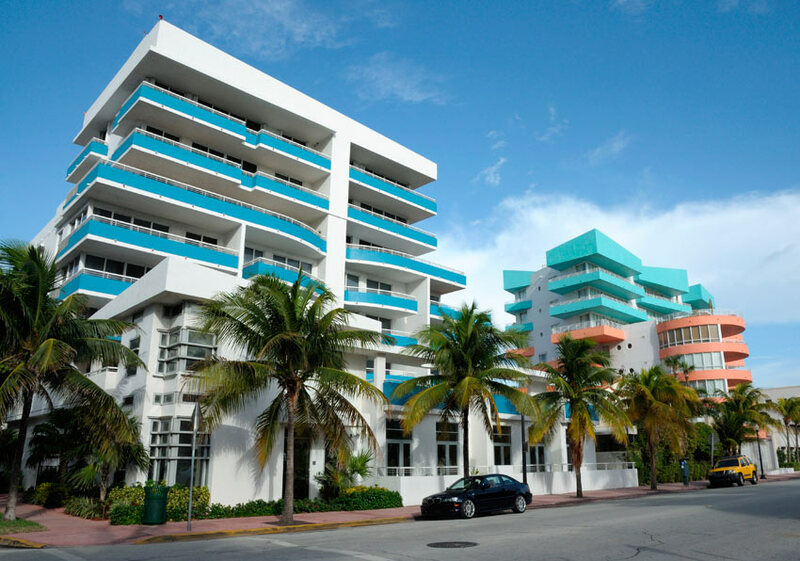 So much so that Miami Beach (which just turned 100) has been included in the National Register of historic places of the United States, being a city with a high quantity of Art Deco style buildings. Around 20 streets in South Beach there is a concentration of about 1,200 Art Deco buildings in preservation, in what’s known as the Antique and Historic District of Miami Beach. Built at the end of 1920s, the Art Deco District is comprised of hotels, restaurants, and residences with elegant and colorful fronts complete with ornamented trim, molding, and carvings. During the Great Depression of 1929 this architectural style based in tropical and pastel colors, neon signs, and geometric lines played a role in lifting the spirits of a society beaten by the worldwide economic crisis. The Art Deco District in Miami was, in the 20s, the prime destination for the upper class. In the 50s (as was shown in the movie Scarface starring Al Pacino) it was the chosen location of the mafia and of gangsters escaping from Cuba. In the 70s it began to be preferred by retired and elderly people but later in the 80s artists such as Andy Warhol and series such as Miami Vice made Miami Beach well known to the whole world. The main street of the Miami Art Deco District is Ocean Drive, known for it’s fabulous ambiance, restaurants, clubs, great variety of exotic characters, and upscale automobiles. Those tourists who find themselves touring the city by rental car can go through the district starting at the extreme southern end of Ocean Drive between 6th and 7th streets. There you’ll see the Park Central Hotel (630 Ocean Drive), The Waldorf Towers Hotel (860 Ocean Drive), The Colony Hotel (736 Ocean drive), The Edison Hotel (960 Ocean Drive), The Art Deco District Welcome Center (1001 Ocean Drive), The Victor Hotel (1144 Ocean Drive), The Leslie Hotel (1244 Ocean drive), and The Carlyle (1250 Ocean Drive), among others. Turning right on 15th street will allow you to appreciate, from your rental car, Haddon Hall (1500 Collins Avenue). After continuing south along Collins turn right on 13th St to see the Miami Beach Main Post Office (1300 Washington Avenue) and The Astor Hotel (956 Washington Ave). To finalize the trip, you can return in your rental car along 10th St to Collins Ave to marvel at The Essex House (1001 Collins) and The Hotel (801 Collins). The fully enjoy the tour its recommendable to contract your rental car with GPS in your language through RentingCarz at the best price through the most reputable companies on the market.